I'm sure there are gardens out there just finishing up churning out zucchini like a well-oiled machine. Here's one way to use them up. Place zucchini in a colander and squeeze out excess liquid. 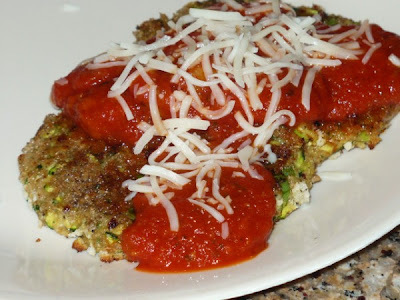 In a large bowl, mix together zucchini, eggs, onions, 1/2 cup Italian style bread crumbs, flour, Parmesan, mozzarella, garlic, pepper, and pesto if using. Place remaining 1 cup breadcrumbs in a small bowl. In a large non-stick skillet, melt 1 Tbsp. butter over med-high heat. Form zucchini mixture into patties; dredge in bread crumbs and place into skillet. Cook about 3-5 minutes on each side until brown and crispy. Add remaining tablespoon of butter to skillet if needed to finish remaining patties. Serve with warm spaghetti sauce.